You've come here to understand more about the Bengal Cat and we want to let you know that you've come to the right place. BengalCatClub.com is the internet's #1 informational resource on the Bengal Cat Breed and we've written hundreds of articles to help people better understand their behavior, diet, care, training, and much more. Due to many requests from our readers, we've taken the time to create this page which is essentially the complete guide to the Bengal Cat. We've done this to help summarize the most important things you need to know so that you can make a more well-informed decision prior to adoption, or better care for a Bengal cat that you already have. You can either read this page from top to bottom, or use the quick navigation below. The Bengal cat that most people know and love is far removed from it's original ancestor, but the history of the Bengal is very interesting nonetheless. The history of the breed can be traced all the way back to 1889 when Harrison Weir, who first mentioned the idea of breeding a domestic cat with the Asian Leopard Cat (ALC) in his book, "Our Cats and All About Them". Though he doesn't specifically mention the Bengal cat as it wasn't technically a breed yet, it does show that the idea of breeding domestic cats and wild cats was a consideration. Cecil Kloss, who was an English Zoologist, wrote to a magazine called Cat Gossip and explained how he had visited the Malay Peninsula and saw a woman caring for Bengalensis kittens, which he believed were a cross between the ALC and domestic cats. Unfortunately though, he was not able to stay long enough to confirm that these kittens had survived, but this is believed to be the first sighting of Bengal kittens. There was a study published by a Belgian Scientific journal about attempts to breed a domestic cat with the ALC. Jean Mill, who is largely considered the greatest influence on the Bengal cat breed, wrote a term paper that "proposed crossing the popular Persian breed of cat with the new Siamese breed to make ‘Panda Bear’ cats". Unfortunately though, "My professor laughed at that as he had expected a topic more practical and commercially feasible, such as hybrid corn or cattle." In the early 60's, Asian Leopard Cats (ALC) were beginning to be imported to the United States more frequently. This was mainly based on consumer interest and the fact that the ALC had a beautiful coat unlike other cats. The problem though was that the Asian Leopard Cat was not domestic and had the temperament of a wild cat, so breeders needed to breed them with domestic cats in order to reduce the "wild cat" traits. Some of the earliest known breeders of Bengal cats were Robert Boudy, William Engler, Delores Newman and Ethel Hauser. Upon successfully breeding first generation Bengal hybrids, interest in the breed continued to grow through various cat clubs promoting the idea of crossbreeding to create hybrid species. Even though the interest was there, the breed was still in it's infancy and not accepted as a domestic breed. The name "Bengal Cat" has been attributed to William Engler, who was a breeder of first generation Bengals for many years. The breeds name, "Bengal", is believed to be derived from the Asian Leopard Cats scientific name, Prionailurus Bengalensis. Jean Mill purchased her first Leopard cat and it accidentally bred with a domestic cat. "Because the animal seemed lonely in my large cage, I put a black tomcat in with my leopard cat to keep her company. Although experts said it couldn't happen, the animals mated and produced a curious little hybrid female named Kin Kin." Unfortunately though, Jean's husband passed away and she had to sell the farm where she created her first Bengal and moved into an apartment and gave up her breeding hobby. Jean Mill pictured with her First Generation Bengal cat, Kin Kin. In the early 70's, there was an epidemic among domestic cats of feline leukemia. Around this same time, it was discovered that most wild cats (ALC's included) had a natural immunity to this ailment, as well as other feline diseases. This knowledge led to Dr. Willard Centerwall, a professor at Loyola University, to begin breeding ALC's in an attempt to transfer these immunity characteristics to domestic cats. During this time, Jean Mill continued attempting to refine the breed so that it was accepted as a domestic breed. Many of the cats she received at this time were given to her by Dr. Willard Centerwall after he had finished his study. Interestingly, one of the main reasons she persisted to attempt to breed a domestic Bengal cat was because adult ALC wild cats were being murdered and exploited for their pelt in the fur market. The ALC kittens that remained were then being shipped to pet stores and adopted by unsuspecting homeowners. This created a large problem because the kittens adopted were wild cats and their temperament was not fit for domestication, so most of them escaped their homes or were given to the local zoo. Jean is quoted as saying, "I hoped that by putting a leopard coat on a domestic cat, the pet trade could be safely satisfied. If fashionable women could be dissuaded from wearing furs that look like friends' pets, the diminished demand would result in less poaching of the wild species." Only females are fertile for the first few generations of Bengals, so Jean had to find appropriate domestic male cats to mate with the female cats. She settled on a calm and compassionate tabby from a local shelter and a shorthair cat with a bengal-like appearance that she imported from India. The Cat Fanciers Association (CFA) allowed Bengal cats to be registered as domestic cats for the first time in history. Jean Mill registered the Bengal cat with The International Cat Association (TICA) as a new experimental breed. According to this New York Times article, Mrs. Mill's first customer for her Bengal kittens was Michael Nelson of Fair Lawn. Mr. Nelson, who is a nurse, said his interest in genetics had whetted his curiosity about the breed. From Mrs. Mill's cattery in Covina, Calif., two orange kittens with black spots were sent to New Jersey. Unfortunately though, later in this same year, the CFA put a ban on all cats with feral blood because "An unfortunate incident at a C.F.A. show, involving an F1 hybrid." Jean later explained that, "I imported several more domestics from India to make beautiful Indian Mau babies while simultaneously nursing my hybrids. Rumors spread that I was putting wild blood into the Maus (as if I would call the precious few hybrids common Maus!!) and in 1985, antagonists convinced CFA not to accept the Bengals and to retract my domestic Indian line Mau registrations." 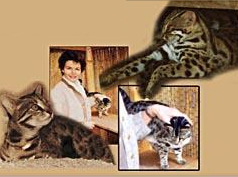 In this same year, Jean Mill brought Bengals to the public attention once again by showing spotted bengal cats with a small percentage of feral blood which were attractive and manageable. From there, the bengal cat population continued to increase through breeders and consumers increasingly were looking to purchase Bengal cats. As the Bengal cat breed has grown in popularity, breeders have been careful to keep the "Wild" look of the Asian Leopard Cat while keeping the temperament of a domestic cat. At this point, most breeders offer Bengal cats that are at least an F6 rating (six generations removed from the Asian Leopard Cat). Because she contributed so much to the development of the Bengal Cat breed, we found it fitting to include this tribute video of Jean Mill, who was instrumental in popularizing the Bengal cat breed and the creator of the (now retired) Millwood Cattery. Also, if you're curious, here is the archive of her website. When you speak about the genetics of the Bengal cat breed, it's always going to revolve around the Filial series (F Series) of the Bengal cat. The Filial series indicates how far removed the Bengal cat is from the Asian Leopard Cat (ALC). As an example, a Bengal cat with an F1 rating means that they are one generation removed from an ALC. F2 is two generations, F3 is three generations, and so on. Bengal cats have always been bred in a way where the F1 Bengal females (because the males in are infertile this early in the filial line) are bred with male domestic cats to produce F2 Bengals. To determine the exact genetic makeup of a Bengal cat isn't a simple thing to do because once an ALC is bred with a female domestic cat, it's genetic makeup is half of the domestic and half of the ALC. From there, the breed will mate the F1 Bengal with another domestic, essentially making the cat 25% ALC and 75% domestic. Or, to understand this more simply, view the table below. Bengal cats are a unique breed because, although domesticated, they still have traces of their wild ancestry from the Asian Leopard Cat (ALC). All of the physical characteristics of a Bengal Cat are dependent on how far removed the cat is from the ALC. For example, if you have an F1 Bengal cat (1st generation) then this cat would be much larger in size than most domestic cats. That being said, it's extremely unlikely that most people will adopt anything close than a 6th generation Bengal cat, so the information below is reflective of that. The average size of a domesticated Bengal cat is no larger than most other domestic cats you'd find. Somewhere between 8-12 lbs is normal and the closer you get to an F1 rating, the larger they are. Full grown F1 Bengal cats can weigh as much as 30 lbs, which is about double the size of a regular cat. We get further into the details about when a Bengal cat is full grown in this article. The life span of a Bengal cat is no different than any other domestic cat. On average, most Bengal cats will live somewhere between 8 to 15 years of age. You can likely increase the age of your cat by keeping it healthy with the best quality wet food and toys or an exercise wheel to make sure it gets plenty of exercise. One of the most frustrating things about owning a cat is the amount of hair you find throughout the house, especially when your cat has hit "shedding season" and is growing a new coat. The good news though is that the Bengal cat are not like other cats. Bengal cats don't just have "hair", they have "pelts". Meaning, the fur on their bodies is much more dense and unlikely to shed like a normal domestic cat. Many believe this is because of their ancestry with the ALC. That said, it's still a good idea to get a nice brush to groom them on a bi-weekly basis. Allergy sufferers will be happy to know that Bengal cats are one of an estimated 13 different cat breeds that are as close to "Hypoallergenic" as possible. This means that they are unlikely to cause allergies, even to people who are known to have allergies to cats. The reason why people are allergic to cats is because they produce what’s known as pet dander . This pet dander contains a common allergen that is said to affect about 10% of the population that are allergic to cats. This allergen is a protein called Fel D 1 and it is found in all cat saliva. While the Bengal cat still produces this pet dander, the level at which they do so is much lower than other cats. That being said, we suggest that if you're looking to adopt a Bengal cat, you spend time with one and see how well you or your family member with allergies react. This will reduce the chances of you adopting/surrendering the pet back to the breeder and wasting a lot of money in the process. The coat colors of a Bengal cat can vary significantly and a lot of this depends on what species the breeder choose to breed the Bengal cat with. There are typically four coat colors that most people have become accustomed to with Bengal cats, but this can always differ based on the breeder. There is such a thing as a long-haired Bengal as well. Though it's not common, it does exist and it's pretty darn cute if we do say so ourselves. Unfortunately though, we couldn't find a picture of one that we are able to share here. Please note, Bengal cats have a very unique trait in their coats known as "glitter". This means exactly what it sounds like. A highly pedigreed Bengal cat will look as if it has had glitter spilled on it's coat and will shimmer within light. Below are the four most common coat colors of a Bengal cat. Brown Bengal: The brown Bengal is the most common pattern that people think of when they think of the Bengal cat. Similar to the Asian Leopard Cat, this is the coat that originally intrigued so many people with the breed and helped it rise to popularity. Snow Bengal: The snow Bengal, which is technically called a Seal Lynx Point coat, is similar to the brown Bengal, but different colors entirely. These Bengals have a creamy white color to them and light or dark brown spots throughout their coat. Beautiful and very unique, there aren't a whole lot of these Bengals around. Silver Bengal: The silver Bengal is the newest color addition to the breed and it's a light gray with dark black spots throughout. Because these are newer, not all breeders will have them, but it's a beautiful looking cat for sure. Black Bengal: The black Bengal cat is also harder to find, but really pretty. Many breeders have begun calling these cats "Pantherettes" because their coat and patterns aren't always visible, which is very similar to a panther. Although today's Bengal cats are typically far removed from their wild cat ancestors of the Asian Leopard Cat (ALC) family, it's important to realize that Bengal cats are different than other cats. Sure, they still purr and want to play like any other cat, but there are some very specific characteristics you'll notice about the Bengal that make it a very unique breed. Like any other cat, Bengal cats will get along with other pets so long as they are socialized as a kitten. If you're looking to adopt a Bengal cat, make sure to ask your breeder how well socialized the kitten is. In most cases, kittens from breeders don't have social issues because they are in a house full of other cats from their own litter and usually a dog or two. However, it will always depends on the breeder so make sure to ask. But overall, Bengal cats definitely do get along with other animals. ​One of the biggest personality traits you'll notice with a Bengal is that they are practically fearless. It's very unlikely for them to cower and hide from other animals like some cats. Instead, they will typically begin playing quickly, regardless of the size of the other animal. That said, they aren't typically aggressive. So although they tend to play rough with other animals (mainly because they always want to be the alpha/dominant animal) it's unlikely that they are actually trying to hurt another animal unless that animal attacks or they feel threatened. In terms of getting along with children, the Bengal cat does this well. Truth be told, they aren't all that different from other cats in their demeanor around children and as long as the kids play nice with the Bengal cat, the Bengal will play nice with them. One nice thing about Bengals is that they are always curious and because of this, they won't be afraid to smell and snuggle up to a child in an effort to understand them. To illustrate how well Bengals can get along with children, we found this video of a 7 month old baby cuddled up with a Bengal cat. While the Bengal tends to be pretty vocal with loud meows during the cuddle session, you'll notice that it never once acts aggressively toward the baby. This is especially impressive at about 2:30 when the little baby decides to grab the cats tail with a very firm grip. But, as you'll notice in the video, the cat still doesn't get aggressive. As with any cat, it's important to supervise your children while they are interacting with the cat to make sure that they don't play too rough. Had this baby not let go of the Bengal cats tail, there is a good chance that the baby would have gotten a scratch on the face from a very unhappy Bengal. Bengal Cats are incredibly playful and you'll either need to give them plenty of attention, or have another pet in the house that they can play with. We highly recommend that if you get a Bengal, you understand this prior to adoption. Many cats sleep for most of the day and while Bengal cats get their fair share of z's, they play much more often and tend to be very curious cats. To assist with this, we've created a few posts that should help you buy the proper equipment prior to adopting a Bengal. The video below shows you just how playful Bengal cats are. While watching this video, you'll likely see things that you've never seen a cat do before like sliding down a slide on purpose, playing on an exercise wheel, opening doors, walking around in a riverbed, and even playing with an iPad. It's hard to find a study that suggests that Bengal cats are more intelligent than other cats, but from their actions it appears that Bengal cats may hold more intelligence than other breeds. What you'll find with a Bengal cat is that they are easier to toilet train (yes, this is a thing, we wrote about it here), they can open up doors, solve simple puzzles, and even be trained to shake hands and do other simple commands that most small dogs will do. Below are two examples of just how smart Bengal cats are. In this first video, you'll see a Bengal cat playing with a "Dog Brick". This is a toy given to dogs that forces them to solve the small puzzle of the brick in order to obtain treats. As you'll see, the Bengal has absolutely no issues solving this one. This next video shows what happens when an owner decided it was a good idea to put a mouse on the top of a door and make it out of reach for the cat. The interesting thing here is that you'll see the Bengal move the door closer so she can make the jump. Unlike almost every other cat out there, Bengal cats are able (and willing) to learn commands from their owners. Beyond that, it's possible to train a Bengal cat to go on walks with you outside. Although you may end up getting a few looks from confused passers-by, this is one of the coolest things about the breed. Below are two videos showing how a Bengal cat can be trained. You're about to see a cat sit, shake hands, give a high five, turn around, beg, and lay down. The owner doesn't just do this once, he does it multiple times and it proves that the Bengal cat actually understands and acts based on his commands. This next video shows you two Bengal cats who have been trained to walk on a leash outside. You'll notice that the Bengals are calm throughout the walk and never cause too much tension on their leash. As you can see from these two videos, Bengals are much more willing to be trained and seem to understand commands better than most domestic cats. That being said, it isn't easy to train a Bengal cat and will take some work, but it can be done. Bengal cats aren't that much different than domestic cats when it comes to biting habits. When a Bengal cat bites, most of the time it's out of playfulness and boredom. They aren't an aggressive breed, so the biting that they do is usually just them trying to play with whatever object they are biting. Most people will receive a Bengal as a kitten and at that time, it's a great idea to train them that your hand is not a toy and it's not okay to bite it. This can be a little difficult when you first get a kitten because they're so cute and it's easy to tickle their belly to get them riled up, but when they grow older (and get a much stronger bite) they'll think it's okay to bite your hand, just like they did when they were kittens. The difference now though is that these bites can really hurt and it's not uncommon for the Bengal (like any other cat) to draw blood. Below is a video of what happens when a Bengal Cat doesn't understand that it's not okay to bite their owners hand. Even though the cat doesn't bite hard, it still doesn't understand that this is bad behavior. Bengal Cats are a very vocal breed when compared to other breeds. As you may now understand from what has been written throughout this guide, Bengals are a more intelligent breed than other cats. Knowing this, it's easy to understand why Bengals are more vocal than other breeds. When a cat wants to communicate, the best method they have is to "talk" to other people or animals. That "talking" for them is belting out a nice loud meow to let everyone know they need attention or they have displeasure with a certain situation. Because they are an intelligent breed and aren't shy about expressing themselves, one of the things that you can expect with a Bengal is a whole lot of "talking". Usually they do this because they want attention, but they may also do this if they need their litter box cleaned or need a food or water dish refilled. The thing to understand is that if a Bengal cat is meowing at you, it's trying to get something from you. Pay attention and you'll probably be able to figure out why they're meowing about relatively quickly. Below is a video showing what happens to one Bengal cat owner every day when she arrives home from work proving that Bengal cats love to talk to their owners. Bengal cats love showing their owners affection and there is almost no better way to do than to cuddle. Bengals really aren't all that different from other domestic cats, cuddling is something they definitely enjoy. They are exceptionally affectionate and bond extremely well with their owners. However, like many other cat breeds, the cuddling they want to do will be at their own accord. If you try to force a Bengal to cuddle, you're likely to be met with a loud meow, a hiss, or even possibly a scratch. We'd like to point out that, just like domestic breeds, each Bengal cat will have a different preference for cuddling. Some will want to cuddle every night, while some may only cuddle a few times per week. This all comes down to the Bengal cats personality and the relationship it has with it's owner. One of the best ways to encourage cuddling is to do this while they are a kitten. That way, they're comfortable with it and find it enjoyable as they grow older. Below is a video showing how much one particular Bengal cat enjoys cuddling with their owner. Bengal Cats are derived from the wild Asian Leopard Cat (ALC) andn as we know, the ALC and other wild cats don't have pre-made meals ready in the wild. Obviously, your Bengal cat is a little different because it's domestic, but that doesn't mean you should be lazy about your food choice. All cats, whether a Bengal or not, will benefit greatly from a well-balanced diet that's free of fillers. This means that in an ideal world, you would refrain from giving your Bengal cat any type of cat food at all and instead just feed them a raw diet. That being said, we know that this isn't the most practical thing in the world. Because of this, we've written two blog posts that detail everything you need to know about the best Dry Cat Food for Bengal Cats and the best Wet Cat Food for Bengal Cats. But if you're short on time, here are a few things to realize about the Bengal cat diet. It's important that you know how to read the label on cat food. Too often, Bengal cat owners focus on ingredients, but overlook the actual nutrients in the food, especially protein and fat. It also seems to have gotten quite trendy today to avoid grains and carbohydrates in cat food, but, many experts say that these things are not always bad as long as they are eaten in moderation. Also, foods that are considered best and are made with just protein and fat can be pretty high priced. If there are small amounts of carbs in the food, then cats should be able to handle it. BHA, BHT & Ethoxyquin – These three items are chemical preservatives that are effective in preserving dry food. However, they are suspected to be possible cancer causing agents. Many reputable cat food manufacturers have now moved toward using preservatives that are natural like vitamins C and E.
Corn Meal as a Filler – Some dry foods can have as much as 50% grain in them and the carbohydrate content is far too high for any cat, especially for older cats and those with diabetes. A little bit of carbs is fine, but not the percentage that can often be found in dry foods. Almost all dry food has some type of filler in it to try to keep the ingredients together as little pellets. In an ideal world, you would give your Bengal cat a diet that was either pure raw meat, or wet food at all times. That being said, this isn't the only option that you have. If you're short on cash or simply don't have the time to cut up raw meat or always feed your Bengal cat wet food, it's okay to give them some dry food every day or two. In the interest of your Bengal cats health, it's best to not strictly give them a dry food diet as that will lead to obesity and can lead to other problems later in life. However, once in awhile is okay as long as you purchase a quality dry cat food that has less fillers and carbs than competitors. The most common mistake that people make when feeding their Bengal cats is that they over feed them. This, of course, can lead to obesity which is the most common disease that is seen in cats. Experts say that you should feed your cat between 24 to 35 calories for each pound of weight per day to keep them at a healthy weight. Like other cat breeds, the Bengal isn't completely immune to feline disease. We have created an in-depth blog post about this exact subject that you can find here. However, if you're just looking to understand some of the most common issues that a Bengal Cat may have, those are listed below. Progressive Retinal Atrophy (PRA): Health issue that seems to be increasing and it’s a disorder that makes the cone and rod light receptors in the Bengal cat’s retina to begin to slowly start to deteriorate and then it typically will lead to blindness in your Bengal cat. Unfortunately,there are no tests at this moment that can detect PRA in the breeding stocks of Bengals. Recently, PRA has been linked to a lack of a chemical compound called "taurine". Bengal cats as a breed need more taurine than their other domestic counterparts. So make sure you ask your vet or even the breeder you get the cat from how you can get more in their diet. Cataracts: These are film that forms on the eyes and they can slowly turn the normal, clear lens of your Bengals eye opaque instead of clear. This is something that can actually be inherited, caused by some type of injury to the eyes or a side effect of another illness. Cataracts can cause blindness if they get bad. However, one amazing thing about all cats is that they adjust extremely well to being blind. Hypertrophic Cardiomyopathy (HCM): This is a disease of the heart muscle and is one of the most common heart diseases found in all cats, including Bengals. This is a progressive disease and a lot of cats will experience heart failure and usually die from HCM after many years. Many experts believe that HCM is inherited and can then be accelerated if the cat has hypertension and/or hyperthyroidism. Both of these things can cause the ventricle to thicken. The quality of life and the lifespan of your Bengal will depend upon a variety of factors. Early detection of HCM will give you the best control of this life threatening disease and you can detect it early by asking your veterinarian for an echocardiogram, which is similar to an ultrasound. Chronic Renal Failure (CRF): Even though it’s common in all cats, recently it seems there’s been increasing numbers of Bengals that are coming down with this health problem, which essentially means that their kidneys are failing. It is recommended that after your Bengal reaches the age of seven, you should take them in to see the vet to be tested for CRF on a yearly basis. Your vet will perform both blood and urine tests in order to detect this disease. Your Bengal cat will have the best chance of controlling this disease if it’s detected in its early stages. If caught early enough, your Bengal should be able to go on to live a happy and full life. Feline Leukemia (FeLV): If you've ever heard that Bengal cats don't get FeLV, It’s a myth that originated from the efforts of early breeders when they were trying to figure out a way to isolate the gener of the Asian Leopard Cat, which is immune to FeLV. Bengals can come down with FeLV just as easily as any other cat. FeLV is called a retrovirus and what it does is rewrite the RNA of a cell so that it can copy itself onto the cells DNA. After it has done this, it can’t be stopped or reversed or cured and this infectious disease leads to death in all domestic cats. Any cat, including Bengals who end up with this horrible disease can in some rare cases live years after being diagnosed. However, more commonly they only survive for just a few weeks after they are diagnosed with it. It all depends on the cat and how soon the FeLV is discovered. We've spent hours reviewing and analyzing all of the different cat products out there to see which are best for Bengal cats. If you're in the process of adopting a Bengal kitten, or you're looking to purchase a new item for your Bengal cat, the lists below will make your decision process so much easier. Bengal cats are a designer breed. This means that if you want one, you'll be dealing with a breeder at some point. The Bengal Cat isn't something you're likely to find at an animal shelter and there are only a few rescues we know of in the entire country. That being said, it's extremely important that you choose a reputable breeder that genuinely cares about the well-being of their Bengal Cats. While we'd love to say this is all Bengal cat breeders, unfortunately that isn't the case. Like any popular breed, the Bengal cat breeding world has a few rogue "breeders" who are quick to accept your Paypal payment and then suddenly vanish. Or, even worse, people who know they can make a quick buck by selling a sick or diseased Bengal cat and will breed specifically for finances and not for the well-being of the breed. That being said, if you find a breeder and it seems too good to be true, it probably is. Knowing this, we've done a lot of research to find the best Bengal breeders and Bengal rescues that exist and that information is listed below. We've spent hours researching to compile a list of trusted Bengal Breeders that you can contact if you're in the market for a Bengal kitten. Before you adopt, we suggest that you spend time reviewing this guide a few times to really understand what to expect with a Bengal as they are different than other breeds that are out there. If you've done that and feel ready to move to the next step, feel free to click below to view our list of breeders by state. Bengal Cat Rescue Network: Our mission is to ensure that NO Bengal cat roams the streets, goes hungry, sleeps in the cold, requires attention, lacks affection, or remains alone to face an uncertain future. Active in USA, Canada, UK and Australia. Great Lakes Bengal Rescue: Great Lakes Bengal Rescue is a 501c3 nonprofit organization dedicated to rescuing and finding permanent homes for Bengal and Bengal mix cats. We serve Illinois, Indiana, Iowa, Michigan, Minnesota, Ohio, Kentucky, Tennessee, and Wisconsin.